Find the Spark of Inspiration you need to bridge your mind gaps and achieve your goals. 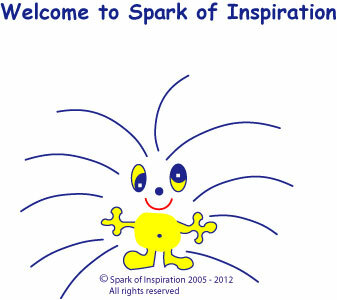 Spark of Inspiration are delighted to welcome you to our online store. Whether you're after a novel gift idea, an educational resource or would like to experience another method of relaxation, we're here to help. In addition to our great collection of educational toys and games for children, Spark of Inspiration also stock a range of inspiring, conversational board games for festive family fun. If you're looking for an extra Spark of Inspiration, why not visit www.HypnoHelp4You.co.uk Blow away your deadwood, for a lighter, brighter future. Are you looking for an Illustrator? Take a look at Chris Reilly's Artwork Contact Chris with your design requests. Spark of Inspiration - educational toy sitemap Spark of Inspiration SITE MAP - come and see our great range of educational toys and learning products for children - lots to entertain adults too.